Swansea Laptop Orchestra use hacked game controllers, laptops and sensors to create and perform experimental, classical, electroacoustic and electronic music. 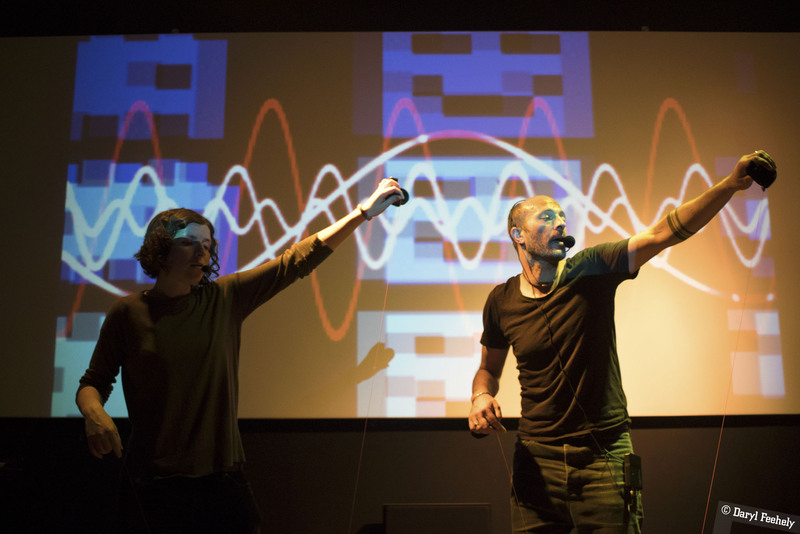 Controllers are used to track the performers' gestures and theatrical movements, bringing a unique physicality to electronic music while also creating a symbiotic audio-visual experience. The Swansea Laptop Orchestra (Swanlork) was founded by Dr. Jenn Kirby in 2015 with founding members Simon Kilshaw and Dr. Paul Hazel. Since its foundation Swanlork have performed in many venues and at festivals around South Wales and the UK. They have also featured on the BBC Radio 3 Exposure programme and BBC Radio Cymru. Currently consisting of members Jenn Kirby and Simon Kilshaw, Swansea Laptop Orchestra are resident in the Music Technology department at the University of Wales Trinity Saint David. Swansea Laptop Orchestra’s repertoire is diverse and you can find them performing in a range of environments such as concert halls, festivals, galleries and cafés. They launched their debut album, loadbang! in September 2017. More information can be found here.